053.Simon Fildes & Katrina McPherson – JavaMuseum 2010 – Celebrate! Katrina has made many single video-dance works that have been broadcast and shown at festivals across the world; Simon Fildes is involved in the on-going development of New Media works in public spaces and in 2000 he was awarded one of the Scotland’s Year of the Artist residencies. Between July and September 2004 Simon Fildes was New Dynamics Artist in Residence in the dispersed communities of Ardnamurchan as part of the Scottish Arts Council supported programme for Social Inclusion Partnership Communities. This was a part-time role to develop new ‘new media’ work with young people. Whilst staying there the award-winning video-maker Katrina McPherson worked along side Simon to create a new work called ‘Ardnamurchan Zillij’. The artists created a collaborative work with individuals from the geographically diverse groups in Ardnamurchan, Scotland . They built up a bank of over 130 digital tiles based on looping moving images. 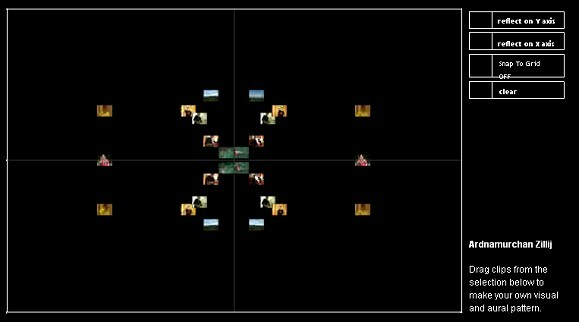 The interface allows a user to select tiles and design a constantly moving colourful mosaic of small video clips. The video clips were created by designing, choreographing and videoing the movement of individuals in the communities of Ardnamurchan and the environment around them, and reducing the clips to near abstract shapes and sounds . The idea to create an interactive moving digital mosaic was inspired by the artists fascination with Islamic Moroccan tradition which relies on geometry and endless repetition as an outlet for expression using shapes called fourmah to create intricate patterns, Zillij. Katrina and Simon were interested in exploring some cultural parallels in this non representational form of art with the west coast of Scotland. Dark driven moments, humour and a sense of loneliness, glimpses of a physical chemistry between two women and two men, all work together to evoke a feeling of something potent and unrevealed. In this work you see two strands of a story side by side, The same characters, the same locations, different choreographic interpretations. What is the Truth? Which version gives the real story? Explore and compare and maybe you will find an answer. You can record and playback your own journey through the work. When you see it again does it seem the same? “The Truth: The Truth” is based on a 30 minute video dance, directed by Katrina McPherson, choreographed by Fin Walker and Paulo Ribeiro and commissioned by Ricochet Dance Productions. In this version Fin’s choreography is in the right hand window and Paulo on the left. 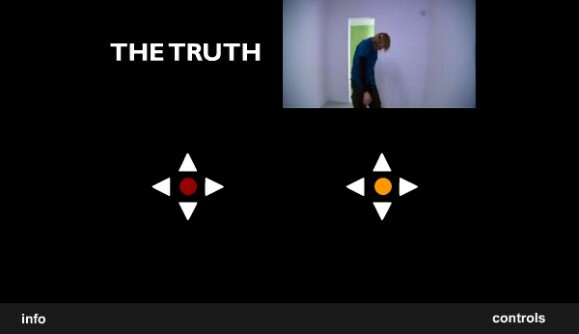 ‘The Truth:The Truth’ is our second exploration of the hyperchoreographic concept. This work allows a fluid flow through the material using simple navigation controls like the points on a compass. Click on the arrows to navigate through the different video clips. We would like to gratefully acknowledge the support of the Scottish Arts Council Dance Department for funding this work.